The radius and ulna are the two forearm bones that connect with the humerus to make the elbow joint. The radial head is the part of the radius that connects with the humerus. When somebody falls onto their outstretched hand or arm, they can fracture (or break) their radial head. When a bone breaks, it may break but not move out of position (minimally displaced) or fracture and move out of position (displaced). Most radial head fractures are minimally displaced. Provided the turning of the palm up and down (pronation and supination) is not restricted, then these fractures can be managed simply with analgesia and protected but early active motion. Most patients make an excellent recovery after such an injury. Fractures that involve only a small part of the radial head. Larger fractures which are hard to reconstruct- the “entire” head is resected. This should not be performed in the setting of elbow or wrist instability. Fix the fracture with screws (Open Reduction Internal Fixation): This is reserved for fractures that involve larger pieces of the radial head, but the fracture is not in too many pieces to be reconstructed. Radial Head Arthroplasty: This is reserved for a radial head fracture that is in too many pieces to be reconstructed, and when a radial head excision is contra-indicated e.g. 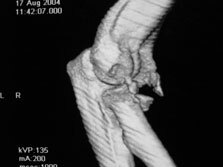 elbow instability (dislocation). Manage the patient without an operation: This should be reserved for the situation where limited expectations and demands will be placed on the elbow in the longer term. The ligaments of the elbow (especially the lateral collateral, or lateral ulnar collateral ligament) are commonly injured when a radial head fracture occurs, due to the mechanism of injury. The ligament must be inspected and repaired if it has been injured to prevent the possibility of late instability form occurring. In all these treatment scenarios, the aim is to achieve an elbow with a pain free and functional range of motion. To achieve that goal, a biomechanically solid construct is required, which will allow the patient to begin early active elbow range of motion exercises, and help prevent stiffness from occurring.